Chocolate Chip. Cookie Dough. CUPCAKES. 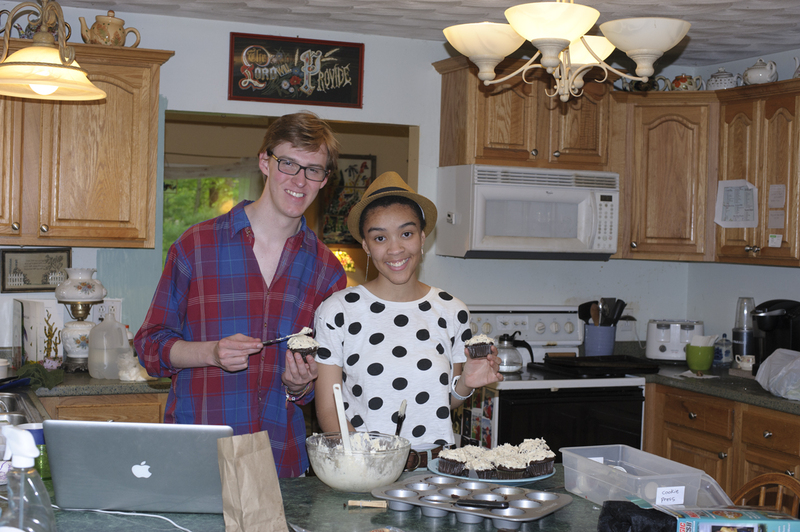 What happens when you bring a cookie chef and a cupcake pro together? Something like this. Two months in the planning, Jake and I finally made our chocolate chip cookie dough cupcakes yesterday. Far from healthy, the combination of cookie dough balls (egg-less, y’all), chocolate cake batter and cookie dough frosting (ohh yeah) is something I wish we’d thought up first. But apparently this already existed, with different versions and varying degrees of doughy-ness and cupcake presence. Clearly, the correct combination includes cookie dough, in the center of a chocolate cupcake, topped with cookie dough frosting. Take it from the real pros, and the may-as-well-be-pros when we say you must experience this. baking soda…and make the cupcake batter. If you think they might be too big when you round them, they are. 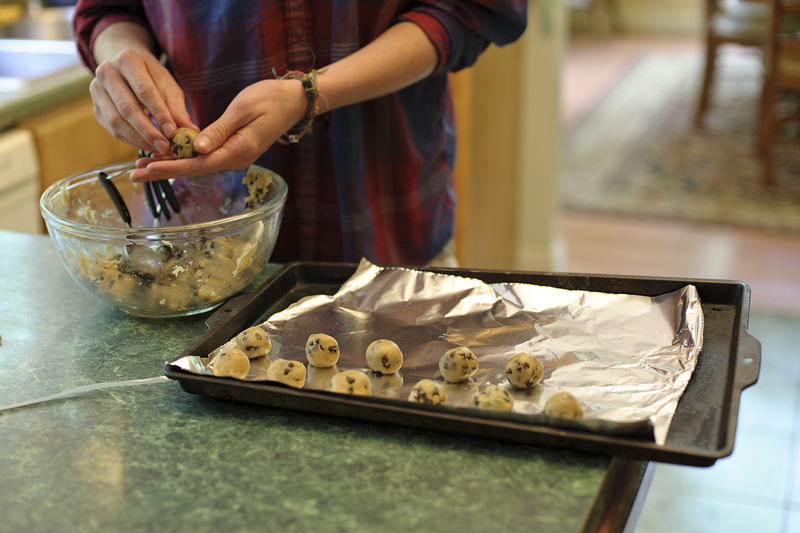 So first you make the cookie dough, which is egg free, so fret not about your salmonella poisoning odds. Though you probably weren’t…sigh. Then you stick the bowl in the fridge, take it out after 15 minutes and roll the dough into little balls. While you’re waiting you can make the cupcake batter. The whole half cup (or 1 if you’re doubling) is not necessary, as we discovered. We do not condone eating this raw, as it does have egg in it. But sometimes you just have to test it, right? The best part was probably dropping the cookie dough into the batter-filled cupcake liners. If you’re only skimming the recipe you may not notice what Jake saw about keeping the dough afloat – if the dough sticks out of the batter and it’s touching the bottom of the liner, cover the dough anyway, even if it sticks out a bit. We tried rolling/turning/flipping the dough balls with toothpicks. This way, they won’t cook as much. a full 1/4 cup worked well. While these are baking, you can make the frosting – don’t skip it if you want the full experience! 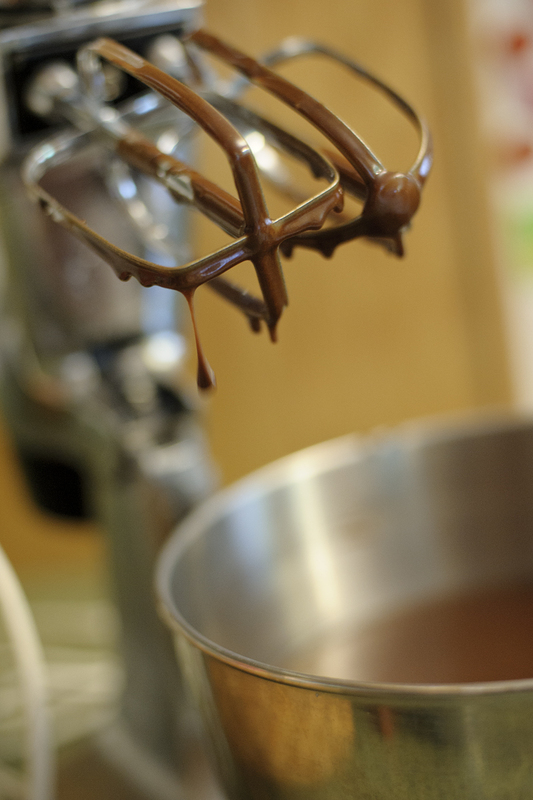 Use of an electric mixer/stand mixer is necessary so you can whip the butter properly for a true frosting texture. 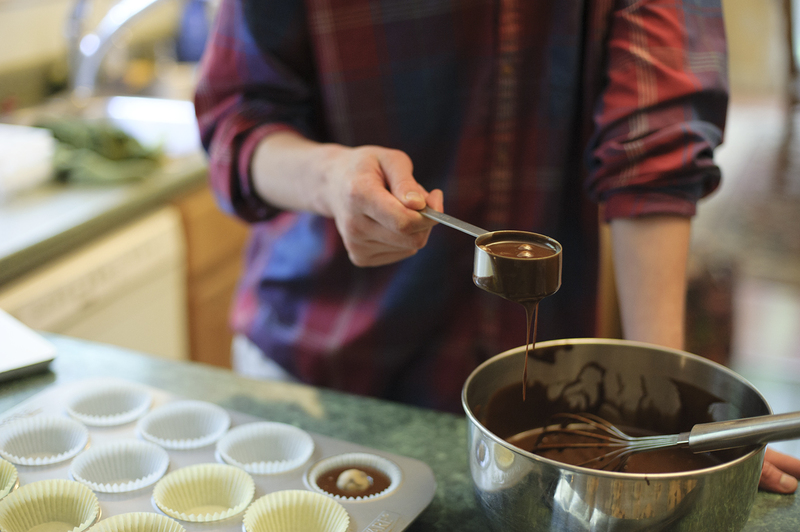 The hardest part of it all may be waiting for the cupcakes to cool before you put the frosting on. But you know what happens if you don’t – melted mess everywhere. And you’re done! Depending on what you were expecting, you may be surprised once one hits your mouth. I think it takes some practice/diligence to perceive the distinct flavor of each part, but maybe that’s not the point. I’m glad we stuck to the raw dough, and that it mostly worked, apart from the occasional cooked crust at the bottom. Play around with different versions and recipes; they’re definitely out there for consumption. Happy baking! You should probably hire us for your next party. Quick note: we doubled the filling & cupcake recipe, and not the frosting: ended up with three or four cupcakes that weren’t frosted. 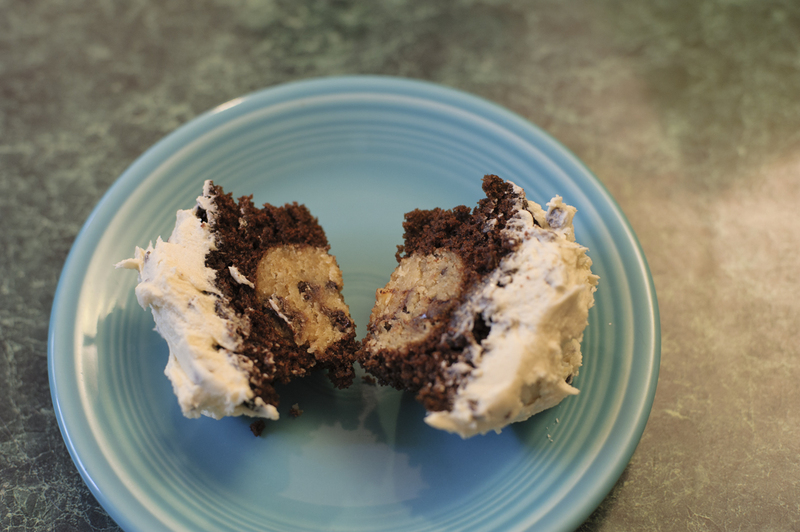 Also, we added the chocolate chips into the frosting as you can see…thought it looked more like cookie dough. 1. 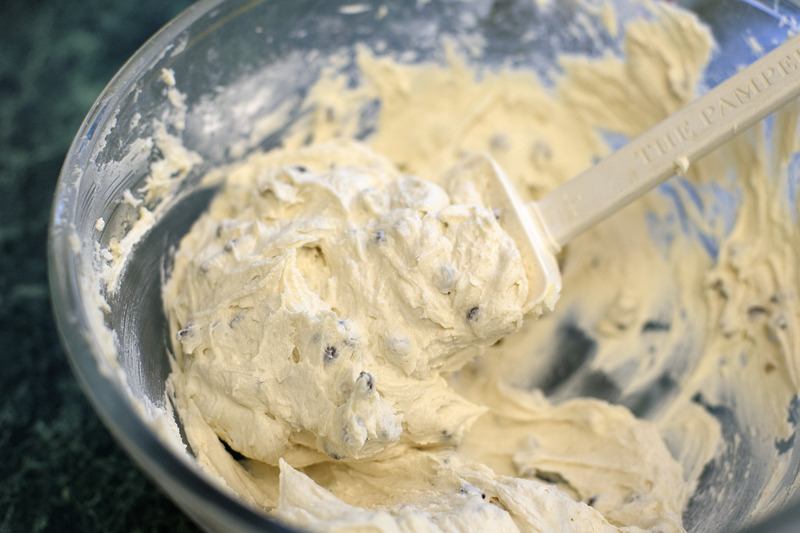 Prepare the cookie dough filling (see *Tips below): In a small bowl, whisk together the flour, baking soda and salt. In a medium bowl, use an electric mixer to stir together the butter, sugars, milk and vanilla. Stir in the dry ingredients and the chocolate chips. Refrigerate for 15 to 30 minutes, or until the cookie dough is firm. 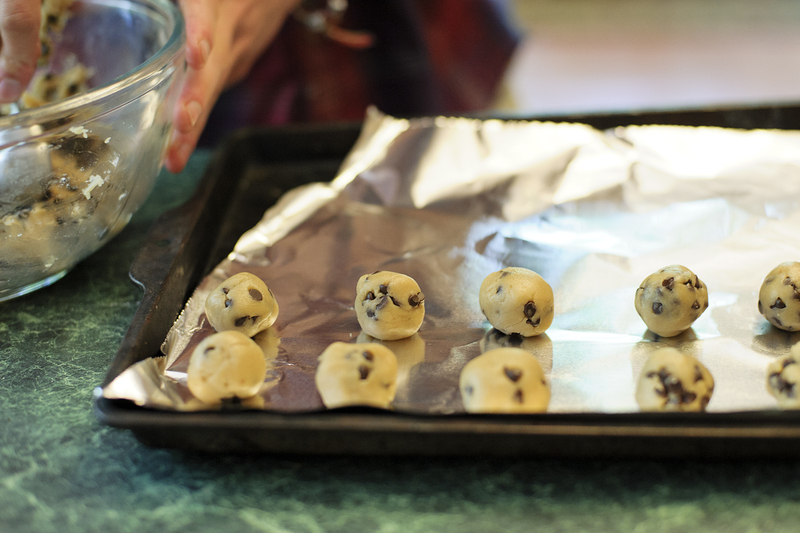 Scoop out dough in 2 tablespoon scoops and place it on a cookie sheet. Freeze until firm, at least 30 minutes. 2. 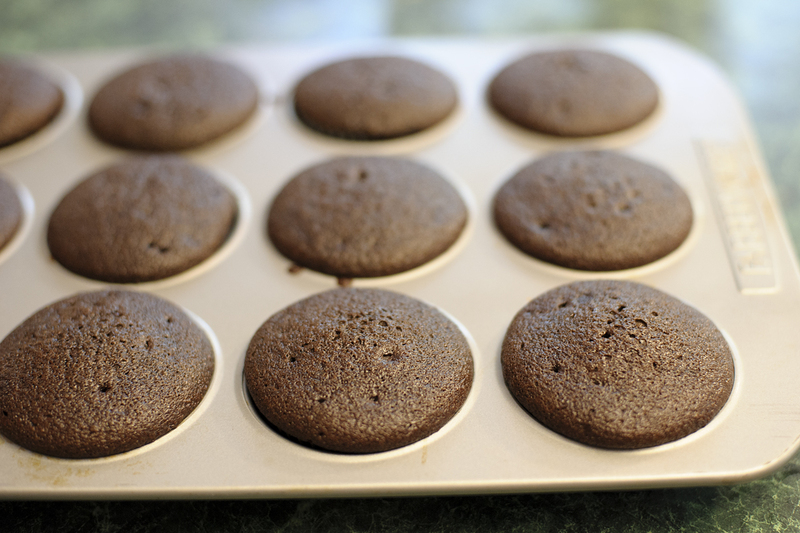 Prepare the cupcakes: Preheat the oven to 375 degrees F. Line a cupcake pan with 12 liners. Place the flour, cocoa, sugar, baking soda and salt in a blender. Blend to combine. Add the water, oil, egg and vanilla. Blend to combine, scraping down the sides as needed a couple of times until all is well mixed. Divide the batter between the 12 cupcake liners. 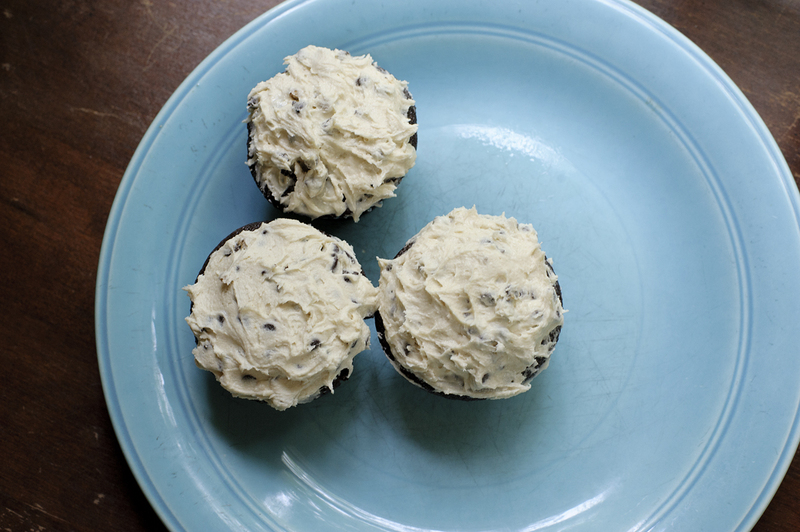 Drop a ball of frozen chocolate chip cookie dough into the center of each cupcake. If you would like the cookie dough to bake up slightly, keep the top visible as pictured in the post. 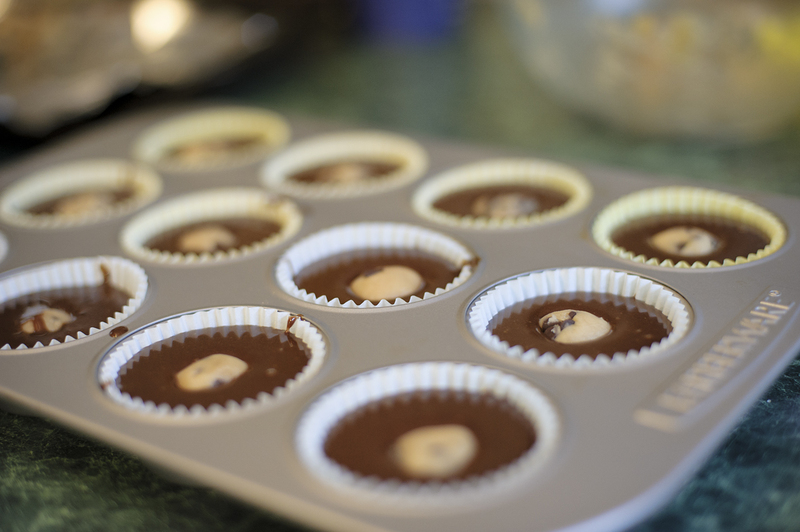 If you’d like to keep the cookie dough somewhat raw, push it to the bottom of the cupcake wrapper, making sure that the batter comes up and over the dough. 3. Bake the cupcakes for 20 to 25 minutes, or until a toothpick inserted into the cupcake portion of the cupcake (not tested through the center where the dough is), comes out fairly clean. Cool the cupcakes completely before adding the frosting. 4. 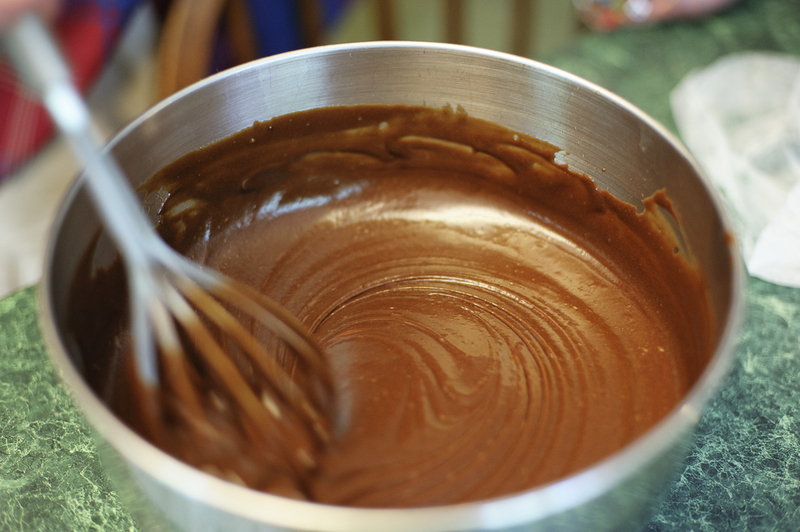 Prepare the frosting: In a medium bowl, use an electric mixer to combine the butter and sugars until smooth and creamy. Mix in the flour, milk and vanilla and continue to mix until all is well combined. 5. Assemble: Frost cupcakes with a knife or scoop the frosting into a piping bag and pipe it on decoratively. Sprinkle mini chips on top and garnish with a small chocolate chip cookie. TIPS:*You don’t necessarily have to melt the butter and refrigerate the dough before scooping. The melted butter just helps the sugar dissolve a bit more so you don’t have that grainy texture in the cookie dough. It is necessary to freeze it though. Check out a first ever homemade cupcake attempt hither!